Convenor, Richard Treadgold, 520 Beach Road, Murrays Bay, North Shore. NIWA has abandoned the official national temperature record and created a new one following sustained pressure from the NZ Climate Science Coalition and the Climate Conversation Group. Spokesman for the joint temperature project, Richard Treadgold, Convenor of the CCG, said today: “We congratulate NIWA for producing their review of the NZ temperature record — more than a year after we challenged it — and we think it’s great that NIWA have produced a graph with full details behind it. NIWA’s complete renunciation of the old graph was confirmed recently by their admission in a court document that the graph was not an “official” record. Which means they have also disowned Dr Jim Salinger’s methodology, which created the graph. Mr Treadgold said that the Australian Bureau of Meteorology, specifically nominated by NIWA to peer-review their work, do not completely endorse it. He also noted a curious error in the letter from the BoM, which twice omits Hokitika from the list of stations they examined. He said, “The Australian Bureau of Meteorology, specifically nominated by NIWA to peer-review their work, give only cautious support to the document. All it will say is that evidence provided by NIWA generally supports (but does not prove) the corrections they made. “The letter contains no such endorsement. All it says is the evidence NIWA provided supports the corrections they made. The BoM says they will assess ‘the ideas, methods and conclusions of the papers’ for ‘scientific error, internal consistency, clarity and scientific logic’. But they say nothing about that assessment and give only cautious support to the document. “We suspect the BoM did not fully endorse NIWA’s adjustments because the lack of raw data meant that a detailed and complete examination was impossible. “The BoM omits the reassurance we seek, so, in the end, the single purpose of the peer review — to give the NZ public confidence in NIWA’s work — has not been met. It is working on calculations of the confidence intervals, or margins of error, which will be published later. It is yet to publish its methodology, which is to be independently peer-reviewed for a scientific journal. Coalition scientists look forward to examining this new series closely over the coming months to determine its accuracy. The two steps outstanding from NIWA will be of great benefit in this regard. Mr Treadgold said: “It’s reassuring to know that, for the first time ever, NIWA understands their own graph. This must be a tremendous relief for NIWA staff and management. It is certainly a relief for the NZ public. “The review is lengthy and full of detail, which we applaud, and it will take some time to examine. We won’t comment on scientific aspects of the 7SS until that has been done. However, we have some initial observations. “Almost all of the 34 adjustments made by Dr Jim Salinger to the 7SS have been abandoned, along with his version of the comparative station methodology. “NIWA is clearly not prepared to defend the adjustments exposed in Are we feeling warmer yet? But it took a court case to force them into a corner. “NIWA makes the huge admission that New Zealand has experienced hardly any warming during the last half-century. For all their talk about warming, for all their rushed invention of the “Eleven-Station Series” to prove warming, this new series shows that no warming has occurred here since about 1960. Almost all the warming took place from 1940-60, when the IPCC says that the effect of CO2 concentrations was trivial. Indeed, global temperatures were falling during that period. Yes I agree with Mike Jowesy. You really do need to present the graphs, before and after. Otherwise, it’s just words and opinion with nothing to back it up. For my part, I’m making that happen on WUWT. I’m sure truffle farmer Gareth of Hot Topic will rush to slime you (and me) shortly with his usual grade school prose. Thanks Richard – is the BOM ‘review’ available anywhere? Don’t know – there might be a link at the bottom of the PDF. The BOM letter is in it (must read). This is a local press release and it’s all I’ve had time for so far. Some have been unable to find NIWA’s review, but it’s not hard to locate. Go to NIWA’s web site, click the News link and download the pdf. I didn’t imagine you’d find it so difficult. The BOM review is not a written report, at least it’s not published. There’s just a letter from them on page 13 of the NIWA review document. Anthony Watts seems to think I’m disagreeing with the results of NIWA’s review; I hope he discovers soon that I’m chortling about the fact they conducted a review, because it was solely due to the pressure from the Coalition. I’d like to see the methodology and error bars published too. If Niwa are confident in their analysis then there’s no reason for them not to do so. To the impartial observer, the results of the new series look exactly the same as the old, so I don’t really know what conclusions to draw from that. I can certainly see how critics of the CSC will use it to their advantage. Aside from the data itself, it is interesting to see that recent decades show little warming. Didn’t we recently discuss some climate models that assumed that natural variation could not explain the recent NZ temperature rises?. Not shortly – he did that 5 days ago when the NIWA press release came out. I did just come back from a lunch with a guy from NIWA. This was quite a big deal to them, I think. We should at least give them some credit for undertaking this work, even if it did take a pressure group to make it happen. Kudos too, to Richard and the CSC. I hope everyone has a happy Christmas. I accept your points but some of the guys are just foot soldiers doing a day job like the rest of us. We can’t treat them all as bad guys. I’d also really like to get my hands on the data for the plots. I could digitise this if needed. The small amount of warming since 1960 has piqued my interest, especially in the context of the error thresholds. The NIWA report is exactly the science report that we expected, and meets all of the standards that we in the scientific community expected. Of course, one could ask Prof Hunter whether the same could be said of the previous series, and why NIWA reworked the data to produce the second series. Again, I am looking forward to seeing the ungraphed numbers so that we can plot a line from 1960 onwards. That should be interesting. Gareth seems to rather gloss over this. No mention of the BOM letter and that the audit was “not a reanalysis” – much too inconvenient. When you are able to plot trends Andy, remember that the NIWA trend-line is a warmist contrivance with a selective start date – why fight on their turf. The only straight-line trend we should be overlaying if the record was long enough would start at 1750 (even as per IPCC) after the LIA. I don’t know how this could be done for the NZ record though. Once the long-term trend is established then the cyclic trend curve should show warm phases above the line and cool phases below. The NIWA trend-line is not long-term and obfuscates the cycle. A more honest trend visualization is instantaneous trends at each data point of the cyclic curve with the most relevant being the last (guaranteed not to be +0.9C per century right now) overlaid on a long-term trend starting way before the NIWA start date. Intermediate straight line trends are fine as long as there’s enough to show the cycle (5 lines to show a complete warm-cool cycle). One line is completely misleading as in NIWA’s spin of the NZTR. I’ve just plotted 7SS absolute temperatures from 1960 on and there’s no trend + or – that I can see by eying it. All the significant data is between 12 and 13 C with 12.5 looking representative. Richhard C – I have plotted the data taken from the figure in NIWA’s recent report (and its almost the same as their first series). 1909 – 2009 0.9 degrees per century. (95% confidence level range 0.6 -1.1 degree/century). 1960 – 2009 0.8 degrees per century (95% confidence level range 0.0 -1.6 degree/century). and 1909 – 1959 0.8 degrees per century. (95% confidence level range -0.1 -1.7 degree/century). However, as we would expect the significance for the shorter time periods is a lot less that for the whole time period (hence the large confidence ranges). This is inevitable with such a limited amount of data. (Of course one should not rely on eyeballs for a proper analysis with such data). I suspect NIWA’s comment may be partly related to the structure which shows if you plot 5 year averages rather than any overall trend. After all they are talking about the regional weather effects – wind flows and ocean temperatures. This is of course a very local temperature plot and should not be compared with global temperature plots. Nor is it relevant to government policy which is based on global climate warming – not local. What it does show, however, is there was nothing wrong with the original plot. That people like Richard were being malicious when they claimed that there was and statements like the following taken from Richards report – press release were just dishonest and scandalous. The honest thing to do would be apologise and withdraw. Richard has rather painted himself into a corner. Did you regress to 1750 say? We are still at the top of a warm phase but ENSO will soon change that. 1) Did CO2 take a holiday in the 30s? 2) Has CO2 taken an extended holiday since 1990? If you read the BOM letter you will see that the audit was NOT A REANALYSIS so that’s a premature assessment. There has been no significant warming in New Zealand . since 1955 (watch the Volcanoes in 1963 (Agung), 1982 (Chichon), 1991 (Pinatubo) and the 1998 Niño). My analysis of the claims, including the statsitical significance of the trends, is here – Another local climate change denial meme. There has definitely been warming since 1960. This is just another of Richards lies. Any comments from our statisticians on Ken’s hostile conclusion? Has there been statistically significant warming since about 1960, as evidenced by NIWA’s latest adjusted temperature series? There’s been warming from 1960 – 1980 but ask him for a 1980 – 2009 regression of ABSOLUTE temperatures (NOT anomalies). My analysis using averages . as compared to +0.28 1960 – 1980. No, one shouldn’t – but why not use them when the picture’s plain to see? Or is it a case of “none so blind as those who will not see”? Now that you’ve white-washed yourself into your own glass-house corner – don’t you think it’s time to stop throwing stones? Does this refute Ken’s argument at http://openparachute.wordpress.com/2010/12/24/another-local-climate-change-denial-meme/, where his first graph shows a linear trend for 1960-2009 of close to the trend for 1909-2009? He subsequently muddies the waters by citing the 11-station series, which seems irrelevant because NIWA ignores it in the review, and it was a cherry-picking extravaganza anyway, but he claims a trend between 1960-2009 of 0.85°C/century. Which is quite a bit more than the eyeball “no significant warming” conclusion I came to. Can you say anything about the period 1960-2009 (rather than 1980-2009)? I don’t understand the difference between calculating trends using anomalies and absolute temps — Can you help me understand that, please? My understanding of temperature anomaly is a temperature minus a fixed value, so the trends should be the same. Unless, that is, each value is station specific. Yes, I know what anomalies are. 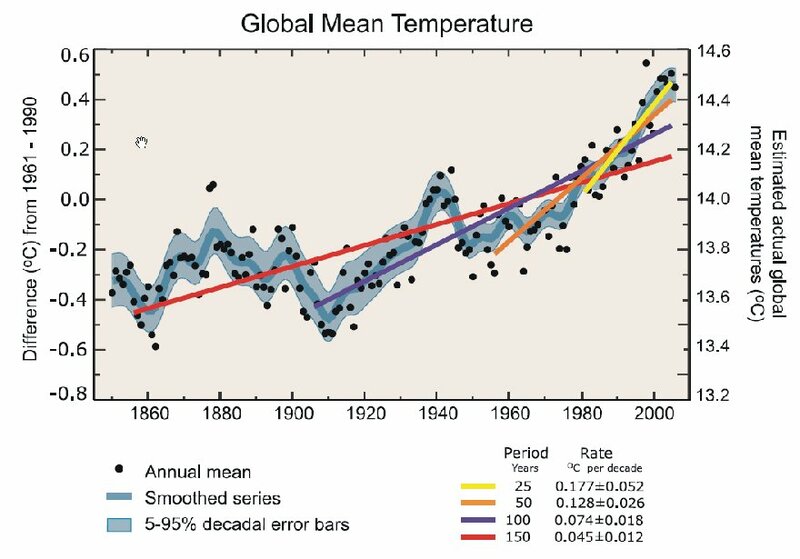 But apparently, when calculating the trend, there’s a difference between using anomalies and absolute temperatures. I thought the results would be identical, so what is it? No, sorry — not a trend. When calculating a regression. But now I must ask what’s a regression. It’s getting complex. It should be the same – trend, regression. You are just moving the y axis? I hope that’s not really a question, Andy, because I don’t know the answer. Why am I moving the Y-axis? The global trend from the LIA is +0.367 degrees per century (HADCRU global warming from 1850 to 2000 +0.55C). The trend overlaying that linear rise is cyclic, so any linear rise or fall can only be applied instantaneously (a tangent to the curve). The linear trends that NIWA and Ken are using are a direct result of the apparent (and erroneous – they assume a cause/effect relationship) CO2/Temp correlation 70s – 90s. That apparent correlation only holds for the up-swing in the warm cycle 70s to 90s so their linear rise is wholly dependent on the start date but notice that a 1909 start means the line obfuscates the cycle (their aim to fool the masses). The only valid start date for the general linear warning trend is circa 1750 (IPCC) or 1850 (HADCRU). Note too, that the IPCC ignores the global 30s – 50s warm phase because it does not correlate with CO2 and the models can’t mimic it because there’s no hump in CO2 ppm levels over that period to force them. i.e. more warming occurred prior to 1960 (during the warm phase up-swing) than after 1960 but it’s cyclic warming – not global warming or even NZ warming i.e. spurious. You need to commandeer someone (Ken?) to overlay the cyclic trend (curve) and to calculate the instantaneous linear trend at the last data point and to keep doing that as the data comes in. I’m not set up to do that but maybe the likes of Anthony Watts, Warwick Hughes or Bryan Leyland? The difference between absolute and anomaly is the baseline. The baseline for absolute NZTR is 0 using the Celcius scale but really it is 0 on the Kelvin scale (-273 deg C) where at that point there is no heat so no temperature whatsoever. When calculating the temperature in space, it is important to understand that most estimates must take into account the varied makeup of space. Outer space is the portion of the universe which is almost entirely empty. Unlike the small pockets of our universe which are inhabited by stars, planets, and other large sections of matter, outer space contains very, very little. Nonetheless, it is not entirely empty, and this is important to understand when considering the temperature in space. The short answer is that the temperature in space is approximately 2.725 Kelvin. That means the universe is generally just shy of three degrees above absolute zero – the temperature at which molecules themselves stop moving. That’s almost -270 degrees Celsius, or -455 Fahrenheit. The baseline for the NZTR anomaly is the 1971-2000 average that at some time in the past was considered a good “normal”, so it’s a convenient reference base but that’s all. That baseline can be changed anytime depending on the time frame but absolute is absolute – that baseline never changes and Kelvin temperatures are ALWAYS positive (except for 0). The anomalies vary positive and negative above and below the baseline on the other hand. The trends are the first derivative so the y-axis baseline is irrelevant when calculating trends. That is my point. The temperature of space? You need to have a thermometer to measure temperature, at which point it ceases to be empty space. Virtual thermometer – like the one Hansen uses. Scroll down to “Joe the Actuary”, but also Easterbrook , Akasofu and Alan Cheetham (the blogger at that site – very helpful). Maybe Joe the Diatribe Guy is just the one for the job. The reason for using “anomalies” is an attempt to compare different measuring stations on an “apples to apples” basis. For example a station in the northern part of New Zealand may indicate average annual temperatures of, say, 25°C whilst one in the deep south may indicate annual averages of around 10°C. It is not easy to compare the two data sets and draw conclusions: a sort of apples to oranges comparison. So, the “conventional” climatologists have come up with this quirky concept of “anomaly” wherein they pick a time period, average the data over that period, and use it as a reference. By subtracting this reference from the measurements they calculate the anomalies for each set which, since they are referred to the same time period, they maintain offers an apples for apples comparison and, therefore sets which have been so treated may be averaged without introducing distortions. It is true that regressions on raw data and anomalies will produce exactly the same trends. But whether measurements from a number of stations can be reliably compared in this manner, I am not so certain. I have a feeling that such comparisons can only be made with any certainty if the statistics of the data sets are very similar. Note, this is the statistics of the sets: it has nothing to do with the errors involved in the measurements. As an example I have noticed that some series have frequency distributions which are unimodal and others are bimodal. Can such sets be reliably compared? Just for the record, I am not a statistician and would be happy to be enlightened. Most raw temperature data sets for NZ I have looked at indicate some rise – not all. For example the Albert Park record (which is part of the Auckland composite in the 7 station series) shows an increase over the 20th century of around 1°C. This has to be put into the context that the likely error in each of the measurements will lie between ±0.5 and ±2°C. So, what exactly does the increase mean? My guess, for what it is worth, is that the increase is largely due to urban heat island effects. By using actual temp (absolute) instead of anomaly when looking at the 7SS composites, the cyclic trend becomes immediately obvious in the data and when the data is plotted. It’s a far more powerful visualization. But then, so is putting a bogus straight line linear rise on a truncated dataset. Plotting the anomaly just shows variation about the 1971-2000 average, with no indication of trend that jumps out. By sticking to absolute, everyone is calculating in the same terms and it’s very easy then to use averages as up thread to show where the significant changes are,. People gazing at the anomaly are missing the big picture entirely but it is useful for visualization of departures from “normal”. I suggest though, that “normal” is a +0.367 degrees per century baseline not a flat average. All physics formulas use Kelvin – no Celcius or Fahrenheit and definitely no anomalies. The mission now is to establish the NZTR start temperature (y intercept) for the “normal” trend . at 1750, 1800, 1850 or whatever date has been used in the work that can be found and the rise from there (slope coefficient). A Southern Hemisphere “normal” may be a proxy. What then, was the “normal” temperature for the start date and the “normal” rise since then? Official climatic normals cover a 30-year period of record, and are supposed to be updated through the end of each decade ending in zero (e.g., 1951-1980, 1961-1990, 1971-2000, etc.). The concept of a normal climate goes back to the first part of the 20th century. At that time, lasting to about 1960, it was generally believed that for all practical purposes climate could be considered constant, no matter how obvious year-to-year fluctuations might have been. On this basis meteorologist then decided to operate with an average or normal climate, defined by a 30-year period, called the normal period. Later, people became aware of the fact that climate is not constant, but undergo variations in itself. Climatic normals are best used as a reference base against which climate during the following decade only can be measured, not over larger time intervals. Comparison of normals from one 30-year period to normals from another 30-year period may lead to erroneous conclusions about climatic change. This is due to changes over the decades in station location, in the instrumentation used, in how weather observations were made, and in how the various normals were computed. The differences between normals due to such non-climatic changes may be larger than the differences due to a true change in climate. The next official WMO normal period is 1991-2020, but before then we probably will see many countries publishing statistics for the periods 1971-2000 and 1981-2010. Once a long-term “normal” trend is established, then a DETRENDED anomaly can be plotted. Has NIWA done this using a long-term trend and presented the anomaly to the public? If not, it’s negligent analysis. Temp anomaly overlaid with POLYNOMIAL and LINEAR trends. A cooperative effort between the Hadley Centre for Climate Prediction and Research and the University of East Anglia’s Climatic Research Unit (CRU), UK. Why doesn’t NIWA do this? The best estimate I can find for the global air temperature to start the trend. y = 0.0045 x + 13.6 …………For yearly data points as per 7SS. Prof Phil Jones told the BBC that there has been no statistically significant GLOBAL warming since 1995. How long is it since there has been any significant NEW ZEALAND warming? (I understand a significant temp signal emerges when it exceeds the error bars in the time series). Must have been before 1990. Interesting development on Hot Topic. Gareth decried Bryan Leyland’s comment that there would be global cooling for the next couple of years, and offered him a wager. Bryan accepted for $200 – on the bet that the average temps for 2011-12 would be below the 2010 average. Gareth has suddenly flip-flopped. Now, he’s unsure about the next few years and will only wager on the next TEN years! By my reasoning, NZ has warmed 0.456 C over the last century in excess of the general warming since the LIA 1850 and was 2.33 C cooler than global at 1909. This is consistent with Ken’s regression of 0.9 C/100 yr since 1909. We’re still missing a polynomial trend overlayed on the 7SS (NIWA that’s your job). We need to differentiate between general warming since the LIA 1850 and warming above that trend. I’ve just done a de-trending exercise (total warming last century minus general warming) on the 7SS and got 0.456 C warming over the last century. I haven’t got a clue about any statistically significant warming or the error range but I don’t think we are anywhere near anything alarming. I’m not a statistician for the record but I have just enough knowledge to be dangerous (like giving a chainsaw to a monkey). 0.456 C could easily be UHI. A more certain bet for Bryan but less to pay out for Gareth.. I calculate a PV of $122.78 @ 5% discount rate. So, 0.45 C general global warming accounted for.over the last century. Now what about that 0.456 C local New Zealand warming? The first 14 years are lost (1909-1922) so the range is 1923-2009. This is what NIWA’s “unequivocal” warming over New Zealand REALLY looks like. Bryan is 75 – payout at 85? Here’s hoping. Rate of 7SS rise since 1962 (47 years) 0.22 C/100 yr (de-trended 15 year moving average). Actual rise 0.1 C since 1962 (0.1 = 0.002215 * 47 by linear regression).